How to give accessories care they deserveWhen you picture a beautifully organized closet, you might be focusing on clothes. They are the star of the closet, right? But what about your accessories? Shouldn’t those shiny, sparkly, “uniquely you” elements of your wardrobe get a little attention, too? From jewelry and handbags, to neckties and shoes, I can give your accessories the home they deserve. SHOES My average customer has more than 50 pairs of shoes, and some of my customers even admit to having more than 100 pairs. You might be tempted to throw them in the back of the closet haphazardly, but there are so many ways to keep your shoes accessible, protected and right where you need them. My favorite way to organize shoes are adjustable flat shelves. These shelves maximize your space and accommodate the largest number of shoes, and adjust to allow for flat shoes, high heels or boots. Insider Tip: By alternating each shoe by toe in / toe out, you can add an extra pair of shoes per shelf. Use shoetrees or tissue paper to help your shoes retain their shape. Wondering what to do with shoes you don’t wear very often? Try a shoebox. These handy, stackable options come in the form of the original cardboard boxes or clear plastic versions. This neat, clean way to guard your special shoes will definitely pay off. Feeling a little obsessivecompulsive? No judgement here! Add a Polaroid photo to the end of the box for quick identification. Always let shoes breathe for several hours before putting them back in their boxes! JEWELRY Whether glittering diamonds, vintage costume jewelry, or your kiddo’s finest macaroni necklace, jewelry should be cherished and preserved. 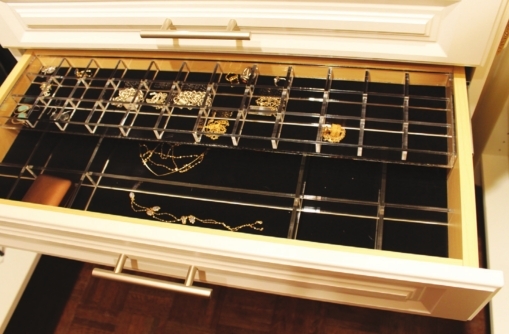 I have several special options when it comes to keeping jewelry safe, including custom-designed drawers lined with plush velvet, stackable acrylic dividers to keep jewelry organized, or a hook wall to display long necklaces and costume jewelry. I can also add locks to the drawers to ensure that belongings stay right where they belong. Gold is a relatively soft metal and can be damaged from contact with other materials. To avoid this, keep your gold jewelry stored separately in soft cloth bags or wrapped in tissue paper. Keep jewelry you wear every day in its own little compartment or drawer, for easy access on the go. 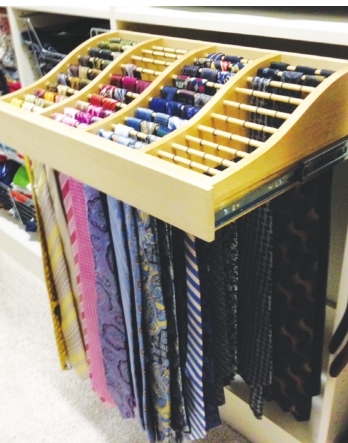 Sort your ties by color to find the right match with no hassle. Always untie carefully and store flat or hanging (not rolled or bunched). Got a stain? Take immediate action. Carefully blot the stain with cold water, or sprinkle talcum powder on grease stains. Bonus: Never iron your ties. Try steaming them while in the shower. If you have questions about organizing your home or designing your dream closet, visit www. melaniejohnsonsclosets.com or call 318-453-0964.